Being in Dubai for the Summer, is perfect for catching up on the un-edited images in my Lightroom library. Just over year ago, I came home from an amazing Icelandic photo-adventure with a few thousand images. A good collection of these can be found in my "Iceland, Land of Fire and Ice" gallery. I personally believe that the image above, which I just edited this week, deserves a higher rating... The fact that the photography software is constantly evolving, obviously helps as well! In order to have a feeling of what other photographers are thinking about a specific image, I often first upload it to my 500px site. After less than an hour, it was clear people thought it was a keeper! Because I don't want to duplicate things on this blog, I would like to refer the readers to the previous 2012 Pic(k) of the week 32 blogpost for more details on the how and where behind the crash. Tomorrow, I plan on going to the largest Aviation museum in Russia; the Central Air Force museum in Monino, about 60 km East of Moscow. 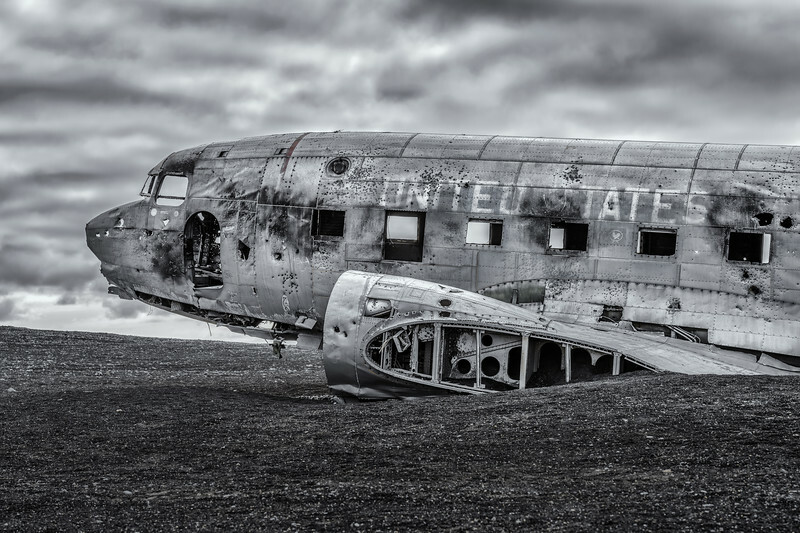 Remember as a pilot we often say; Every landing you can walk away from is a good one". Just finished editing a 3 min animated slideshow of my best Aviation photography shots from Duxford last July. The show can be found in the Duxford Flying Legends 2013 gallery, or by just clicking the thumbnail above. Please make sure you watch it in the best resolution available (1080p) by first clicking on the Auto tab (right bottom) and then selecting 1080p. Since I'm not totally satisfied with the quality of the file uploaded to my site, I've also uploaded a copy to my Vimeo site, which can be best viewed by clicking HD (bottom right of the player). You can a link to it here. Last month I wrote about the amazing Flying Legends airshow I attended at Duxford, UK. I often find myself going back into my image library a few weeks after the shoot, in order to see if anything has been wrongly left out in the initial round. When I started working on an "average" one, I believed I saw the potential to make a 5 star ( maximum stars I allocate, portfolio worthy) image. After a few hours of editing my initial thoughts were confirmed. 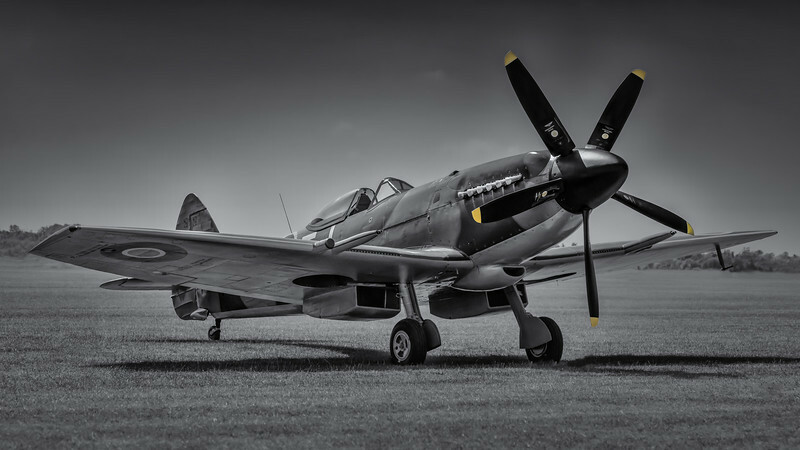 I titled the image above; "Spitfire Mk.XIVe - Mean machine". Mean, this 1944 Spitfire definitively looks! The MkXIV was one of the later versions of the renown UK built WWII fighter, that after the war was eventually sent to India to join their Air Force. She later became own by The Fighter Collection at Duxford and after a long restoration project, took to the skies again in 1992. The quote on my website homepage: "We don't take images, we make them", was definitively true for this one! Unlike for my Street Photography and photo-documentary work, I personally have no problem to "work" my Fine Art images to the best of my abilities. To stay with the warbird and vintage aircraft, theme; I will be attending the "Oldtimer Flieger Treffen" at Hanhnwiede near Stuttgart (Germany) September 5 till 7. With over 300 vintage aircraft attending, weather permitting, it looks like it will be a great show! "Never in the filed of human conflict was so much owed by so many to so few"
The remainder of the individual galleries can be found at the top under the "GALLERIES" tab. The NEW section, list the 50 latest uploaded images in a vertical collage layout. SEARCH now has an animated "keyword cloud" where one can select a keyword or alternatively search using the classic search box. I've also rewritten my own photography bio which can be found behind the ABOUT tab. Links to all of my social media sites can be found at the bottom of all pages. A lot of time was spend optimising the site for tablet and smartphone users. Even though I still recommend the viewers checking out the images as large as possible, I do realise a lot of people use their mobile computers to come here. Always interested in making the viewing experience better, I would love to hear what you guys think... Feel free to leave a comment at the bottom of this post or just use the Contact form on the website to email me with feedback or questions. While I was walking over to the spot where I shot the Sydney harbour image of last weeks Pic(k) of the week 32, I spent about 15 mins or so, photographing some very interesting trees in the local Botanical Garden. The Royal Botanic Gardens were originally founded in 1816 and are a great place to escape the busy city life. As the sun was setting slowly, I was especially attracted to the texture of this amazing tree with a trunk circumference of more than 5 meter. A local park ranger estimated it being "several hundred years old". 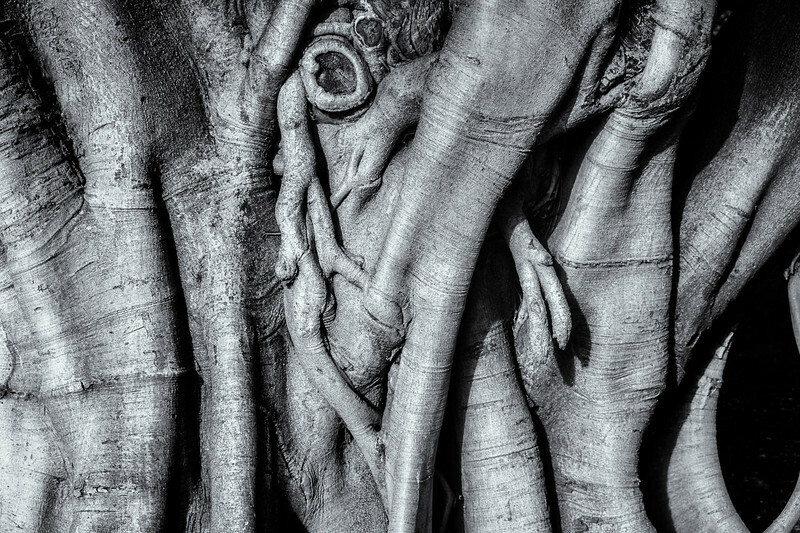 I choose to convert it into Black and White in order to bring out the tonal contrast and texture even more. More of my Sydney images can be found here. Whenever I go away on my airline travels as a pilot, I try to do some photography in my spare time. Planning ahead for these mini-photography shoots is essential if one want to be productive and efficient. Earlier this morning, I landed in Sydney, Australia for a 36 hour layover after a 13 hour direct flight from Dubai. I had planned to sleep through most of the day and then head out at 4pm to Farm Cove, part of the Botanic Garden. Looking at Google Earth and with the help of the free iPhone/iPad app, Stuck on Earth, it looked like this would be the perfect location to photograph the Sydney Opera House and the adjacent Harbour bridge in sunset light. Australia is presently in the middle of Winter, with sunset times around 5.15pm. After having done some online research, I knew that I could take a shortcut on the way up walking through the Botanical park, but that I would have to come back the long way because of a 5.30pm park closure time. 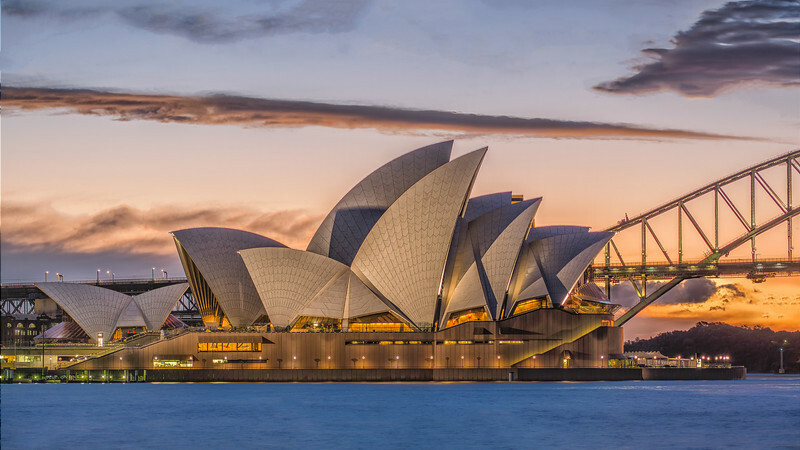 The image above of an Opera House bathing in beautiful post-sunset light, is what the majority went with! The scattered cloud layer was almost exactly what I was hoping for, when I first saw the weather forecast a few days ago... I used a total of 7 bracketed shots, to increase the dynamic range in the image and merged them all together into a 36 bit image. If interested, the second image which was shot about 20 minutes later, can be found here. As there is little outdoor photography to be done in Dubai over the Summer, I've also tasked myself in rebranding/reworking my website. This process should hopefully be complete in a week time.